What if you could put into action the bold ideas and creative inspirations that come to you from your intuitive right brain without second-guessing and doubting yourself? And what if you could override all left brain’ s logical reasons for not believing in those new bold ideas. Traumatic events are stored as fragmented images, body sensations, emotions, and negative core beliefs. All of this fragmentation is scattered within the unconscious brain, ready to trigger a body reaction of ‘fight, flight, or freeze’ when confronted with unacknowledged or unresolved trauma. 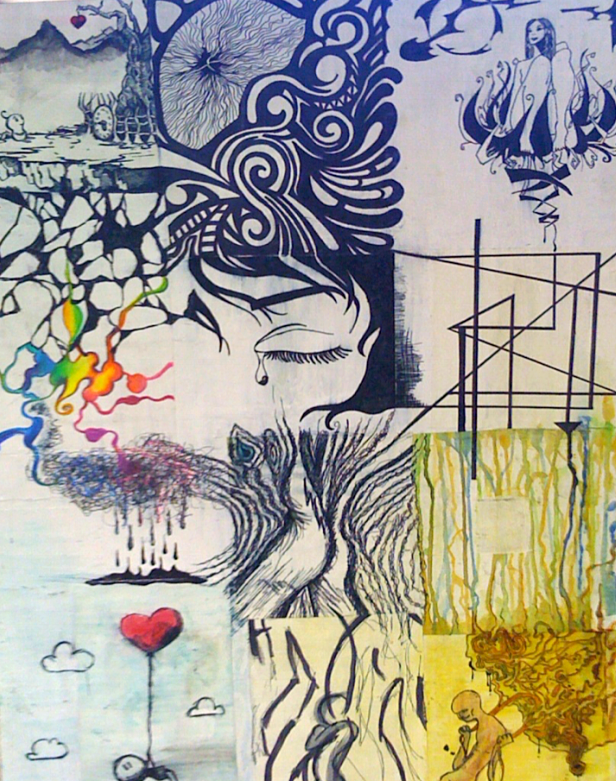 The Cross Modal Arts Strategies give a visual ‘form’ to the chaos and connects these images to a timeline or context of meaning. Imagine that you could manage your doubts and fears by training your mind to observe, NAME and TAME all your negative emotions and thoughts… and now imagine that you had the ability to “SEE but NOT BE” those harmful emotions, body sensations, and thoughts that overwhelm you and keep you stuck in poor behavior patterns? Most people who come to therapy are experiencing such an overwhelming amount of negative body sensations, emotions, imagery, and racing thoughts that they have lost any access to their problem-solving brain. When any of us are on this kind of “system overload”, the sympathetic nervous system gets stuck in a ‘fight-flight-or freeze’ response to the unremitting stress. We find ourselves either getting out of control with anger (fight), anxiety (flight) or paralyzed by fear (freeze) as we shut down. These autonomic nervous system reactions are the body’s ADAPTIVE responses to protect us from further stress or total collapse. However, the nervous system is unwittingly shutting down the brain’s ability to learn new ways to SEE the problem, or to “MOVE” the emotions to safety. As we learn to generate positive imagery using music, movement, words, and inner focus, we unleash the healing power of the right brain and the visual mind. From here we can use the visual mind’s IMAGERY to connect to the body’s natural ability to self regulate, self soothe, and self rescue. BRAINsmART Therapy is designed to dissolve the pain of overwhelming events by re-organizing, re-leasing and re-solving the sensations, emotions and thoughts associated with a past trauma. BRAINsmART enables us to “re-view” our past through a creative lens that brings hope, personal power, and inspiration to our present and future. The BRAINsmART approach is grounded in the latest neuroscience research on trauma, creativity and the brain, which demonstrates that we must ‘go beyond the talking cure’ to heal damages to the body, mind, and emotions caused by traumatic events. BRAINsmART uses the visual, musical, movement, and writing modes to explore the memories that build our ‘sense’ of Safety, and our ‘dialogue’ with Emotions, Loss, and the Future. 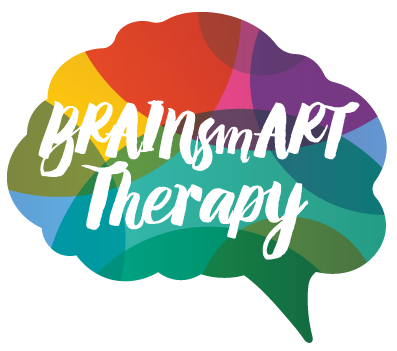 BRAINsmART Therapy is a Cross Modal Creative Arts Therapy – an image-based, problem-solving method to heal trauma through the reconnection of the mind to the body. We offer clients ways to integrate and transform the way their body experiences overwhelming events through creative expression in the visual, musical, and movement arts. Once we can ‘See and NOT be’ the problem, we can integrate it into a meaningful part of our journey. The creative writing, expressive movement, and visualization that naturally emerges in this process allows the body, mind, and brain to work together – instead of against each other – to resolve trauma through communication. Through the latest neuroscience research, we now know that experiencing creative self-expression produces an increase in the reward chemical dopamine and a positive therapeutic shift within mind body and emotions. We know that the right brain disciplines, such as music, art, dance, meditation and visualization, all promote a synchrony and interaction with the left brains’ analytical and methodical problem-solving abilities. This shows that using both sides of the brain, creative and analytical, is needed to improve emotion regulation, increase distress tolerance, and improve problem-solving. We cannot do one without the other. The BRAINsmART method was founded on the premise that the true purpose behind the expressive arts, throughout the history of human culture, has been provide individuals with the inner and outer resources that develop physical, emotional, mental, and spiritual integration. BRAINsmART taps into this body/brain marvel by giving our clients methods to develop the motivation and the courage required to acknowledge and accept new perspectives and new problem-solving modes that can resolve tough issues. By participating in the creative process they engage new patterns of thinking, feeling, and interacting with the world. It is often an unexpected moment that occurs while creatively exploring this traumatic material that holds the important “ah-ha!” Insight in BRAINsmART therapy sessions. Learning to move between Safe and Unsafe states. The BRAINsmART therapeutic process helps clients gain a broader range of solutions to old problems and patterns by connecting with their intuitive non-verbal problem solving abilities. Enabling a creative ‘cross-talk’ between the mind and body , we empower clients to See, Sense, and Speak about their problems differently. Giving them the power to break repetitive cycles of interpersonal and self-abuse, learned helplessness, addictive emotions like guilt and shame, and redirecting the habits of unhealthy attachment styles and negative self-talk. BRAINsmART’s cross-modal approach to therapy works by requiring clients to ‘think laterally’ using both sides of the brain, to conceptualize, visualize, and describe the change they want in their lives. All the stages of trauma recovery can benefit from strategies taken from musical, visual, and movement-based intelligences. This multi-dimensional view of problems attains the most beneficial goal by shifting clients out of their less effective ways of perceiving themselves and others. The most exciting thing to witness in our clients is how creative self-expression, in a SAFE non-judgemental environment, increases both acceptance and compassion for self and others - the foundation stones of a healthy person who can face the challenges of a stressful world with resiliency and creativity. — The Persian Mystic Poet, Rumi Andrew Harvey. From "The Way of Passion: A Celebration"
Imagery is the language of the Unconscious , of memory and of the body.. Our intuitive creative mind ‘thinks’ in pictures - a function of the right side of the brain that talks and listens to the secrets of the body and understands the value of emotions. .What is art and why - when we are handed crayons as children - do we all naturally draw pictures? BRAINsmART therapy understands that we all ‘visualize’ and that visualization- not art- is a natural organic process of the brain, mind, and body. Visualization gives us permission to explore and draw out of our body what we are feeling in the present moment. By ‘drawing out’ what we feel or think we can See and NOT BE the negative emotions/thoughts that hurt us and we can See and BECOME the positive ones. “Drawing out “ and “Seeing In” are the tools we develop for clients to create an honest conversation between their mind, body, and emotions. Music is an intrinsic part of being human and has always played a central role in every great civilization. The human nervous system is a rhythmically designed machine that thrives most when the different rhythms of its internal organs are in sync. Because we are wired for sound, everyone responds to the sounds of music that resonate within and outside of them. In BRAINsmART work, music is a language that we use to help “find our words” when we are speechless or touch our emotions when we are numb . The therapeutic value of music is that songs invite us to connect with our true self whether it is the music we make together or listen to together. Ultimately music helps us “see, sense and speak about different parts of our story that would otherwise be hidden even from ourselves. Movement is IMAGERY in action and our work with movement is to become conscious of both the image and awareness we see and feel as we move. When we make a conscious connection between our emotions and body through movement, we free the mind in a way that nothing else can. Movement is inherent to the human condition and essential to the healthy balance of our inner and outer life. Mental and emotional processes move through the body without our conscious control. When we see a memory or feel an emotion, in our mind’s eye- our body instantly expresses it through changes in our muscles, breathing, and heart rate. When we consciously express an emotion or memory through creative movement we are connecting and integrating the three parts of the triune brain: The survival brain MOVES through the SENSATIONS of an experience, the limbic brain SEES the image created by the movement and the VERBAL brain connects the MOVING IMAGE to a story.Movement for clients who are dissociated from their body because of traumatic events is the hardest modality to work with- but the most important part of their therapy. Linking story that gives it meaning Words have been the foundation stone of talk therapy but we know that we must to go beyond the talking cure to heal trauma and penetrate the body’s secret intelligence . Once we have accessed the imagery of our feelings then we can talk about the image, is the key we must turn to integrate the fragmented parts of people who have had to survive overwhelming events. We cannot always find out words but in BRAINsmART therapy, we create a dialogue with the emotions and the body and the IMAGERY that emerges bears forth the words. What is inner focusing or meditation ? Why should we bother spending time looking inward at our own mind? In BRAINsmART we use visualization as a means to an end. When we can SEE our mind’s racing thoughts and images, we develop the SEE-ER who can observe out the images tricks, treats from a detached awareness. We see the forest and we see the trees and we distinguish them from one another. Drawing pictures of what we think and feel helps us WATCH the moving picture show of our mind with a non judgmental mind as, an an engaged observer. Through this ‘watching’ process we learn to SEE and NOT BE the constant flow of images and thoughts that our mind offers. More importantly, we develop a ‘‘dual awareness’ that allows us to experience our life fully but provides a safe quiet holding place for us to experience our world. WHAT IS THE DIFFERENCE BETWEEN BRAINSMART AND ART, MUSIC, AND DANCE THERAPIES? Have you done traditional art, music, and dance therapy? BRAINsmART increases the value of these expressive therapies through exercises that promote a cognitive link between formative events from the past with core beliefs in the present. 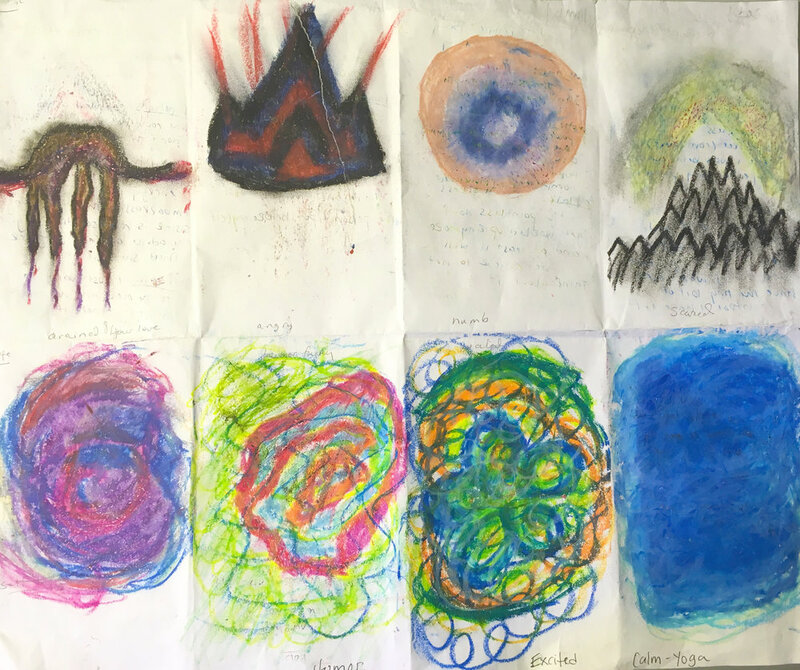 By providing a visual interweave that safely connects traumatic events from the past to the present, the expressive arts strategies help us see and change patterns in behavior, emotion, and thought. BRAINsmART does not differentiate between the different art forms because all of the art forms serve as pathways to an inner focus that leads to insight and healing. The BRAINSmART Way understands that the artist is born within all of us and is an essential part of the human condition. The ‘artist within’ gets covered over by the rigid cultural idea that the purpose of the arts is in performance rather than for the purpose of personal and collective healing.